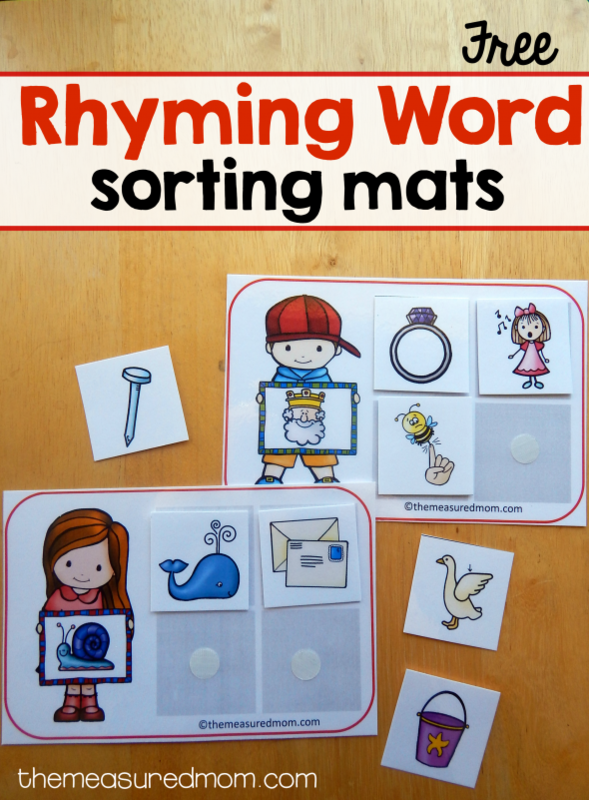 These sorting mats are wonderful for practice with rhyming words! When I asked my readers what they wanted to see next, a number of them asked for rhyming activities. 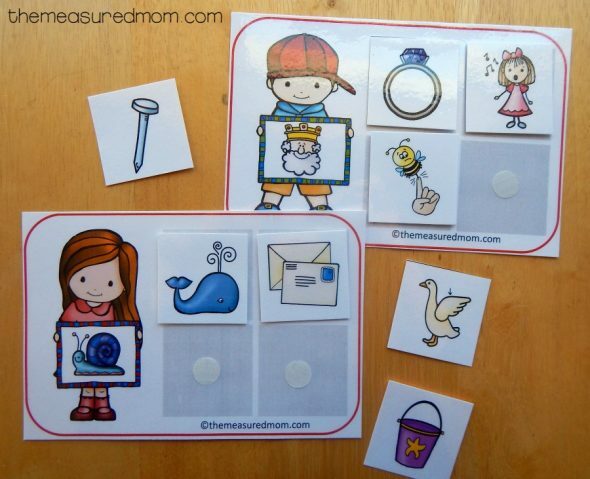 And one reader in particular asked for a rhyming activity in the same format as my consonant sound sorting mats. 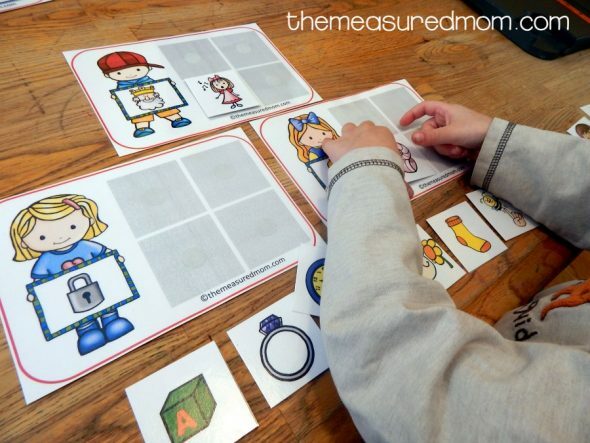 Originally I hesitated to share those consonant sound sorting mats because they aren’t exactly low-prep. But I’ve received lots of positive feedback on them. So… here you are. Rhyming word sorting mats! The download includes fourteen separate mats. On each mat, a child is holding a sign with a picture. 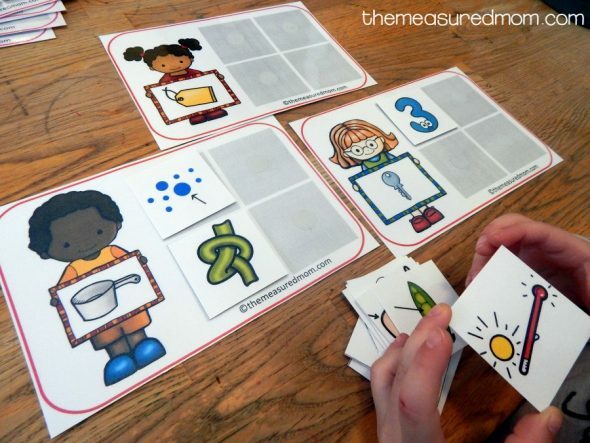 Children need to find the four picture cards that rhyme with the main image. You’ll find rhyming mats for the following words: snail, clap, bell, king, toe, pot, pie, knight, key, glue, plug, snake, tag, and lock. Print the mats and cards. Attach clear Velcro dots to the mats and backs of the cards. Even though his grandparents were visting, I was able to persuade my Four to step away from Grandma time and do a little rhyming. I started with just two mats to keep it simple. I helped him identify the main images on each mat. After sorting between two mats, we decided to go for three. He took off all the pictures (love that Velcro rriiip!) and placed them in a row. I mixed them up. For each card he named the picture and the key images. “Shell. King, shell. Lock, shell. Bell, shell. Yup – bell, shell.” Then he attached the picture to the correct mat. I was pleased with how well he did with these! Maybe it’s because he’s been listening to me read a lot of my Little Letter Books to his 2-year-old sister. They’re packed with rhymes and really help kids develop an ear for them! We did one more set of three mats before he was ready to be done. He loved these, and we’ll be sure to pull them out again! Don’t miss the rest of our freebies! These look great! Thanks so much! These will make great centres! Thank you! Hi I am sorry but I too can not download the file. I have installed google chrome and have update adobe. I have now tried on several computers and it tells me the download has failed no file. I have noticed the file id a PDF and you mentioned in the trouble shooting it can not be a PDF. I am sorry but I can’t find it anywhere else on your site where it is not a PDF. 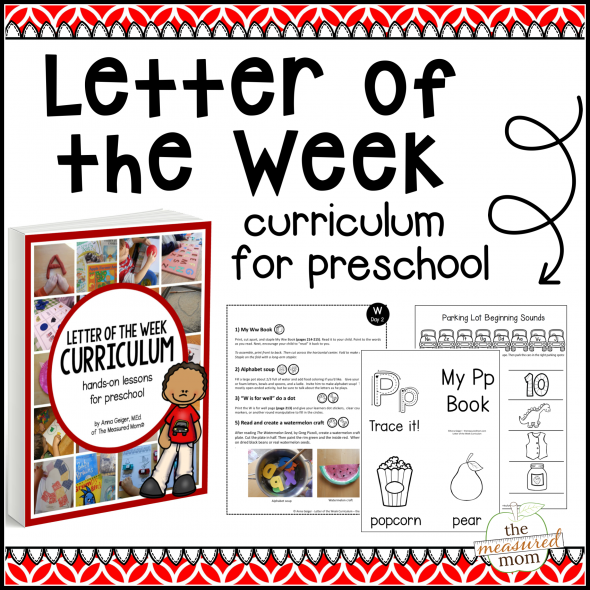 Probably something simple but I can’t figure it out so I thought I better email as I would love these resources and I don’t want to miss put because I can not navigate the site properly. Hi, Shannon! The part about the file being a pdf is confusing. You are correct – the files are available on my site only as pdf’s. But there is a difference between the pdf link and the media file pdf link. If you are starting at the blog post and clicking on the link within the post, you’re in the right spot. You are obviously in the right spot because you are commenting on the blog post. It’s when people share the link to the media file that comes up when they download that it doesn’t work. That may still be confusing, but you’re in the right spot. One of the tips is to RIGHT click on the download link, choose “save link as,” save to your computer, and then open. What happens when you try that? Thank you, thank you, thank you! I appreciate the work that went into making these mats and very child friendly pictures! I know we will get a lot of use out of these during center and circle times! Thanks so much. I’m glad you can use them, Patricia! Thank you for sharing such a fun resource. I am sure the children I am supporting will love it. Hi, l’m interested this activity .I want to download this file when I click on “to get your free printable click here” botton but file cannot access. Could you tell me what should I do? Click where it says “Is the file not downloading? Or is it not printing correctly?” 99% of the time one of those tips works. I love your work. My students benefit…so thank you! I think, if I had your business, I’d consider editable stuff. I know I’d buy at least 3 x more of lots of things, if I could use them across the board. It might not be a money-loser. Hi! These are wonderful! But I am wondering if it is possible for them to be editable? That way I can add the names of the pictures to them. My students need to be able to see the words. At this point, no, I am not able to share editable files. You can always write the names on the pictures. Oh my goodness! What an incredible collection of materials you’ve created! I’m a special ed teacher who works primarily with emergent readers. I am so grateful to have stumbled across this treasure trove! Thank you SO much for your hard work and creativity that makes the life of teachers like me so much easier. What a blessing! THANKS ANNA, MY STUDENTS WILL LOVE THIS!!! I love these! I printed them but the bottom mats on each page printed with vertical lines. Anyone else have that issue? You’re very welcome, Rania! Thank you so much for the kind words! I’m so glad I came across this site. It is marvelous. Hats off to the Measured Mom. I hope you find many useful resources, Bobby! Thank you so much for your kind encouragement, Cheryl – I so appreciate it! Your printables are absolutely amazing! Thank you so much for sharing them. 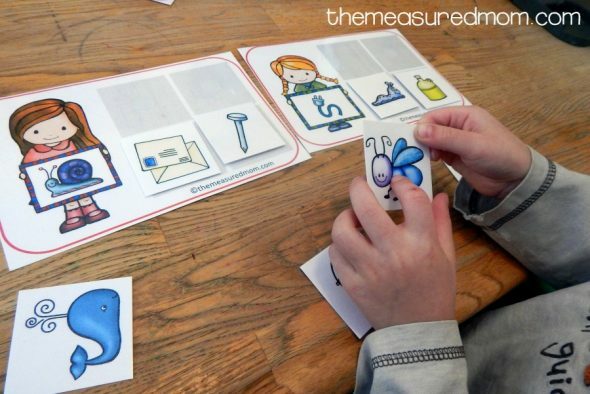 My son normally does not like doing activity books but so far he really likes the phonics activities on your site. I am so thankful to find something he likes. I’m so glad this helps you, Lauren! Anna thank you for all the work you’ve done and sharing with all of us! God bless you and your family. 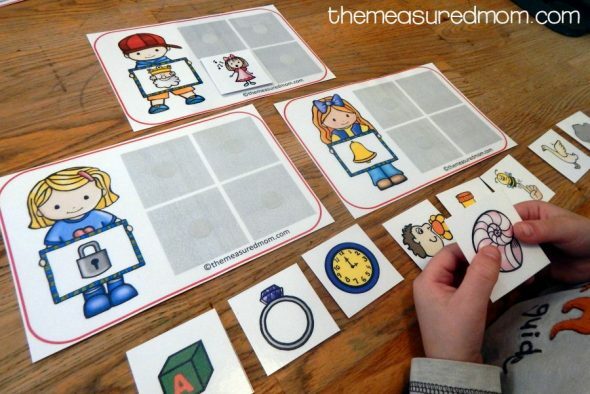 I would really like to print out the rhyming mats, but don’t see a link to click on to bring them up. I tried clicking on the pictures and that did not work either.